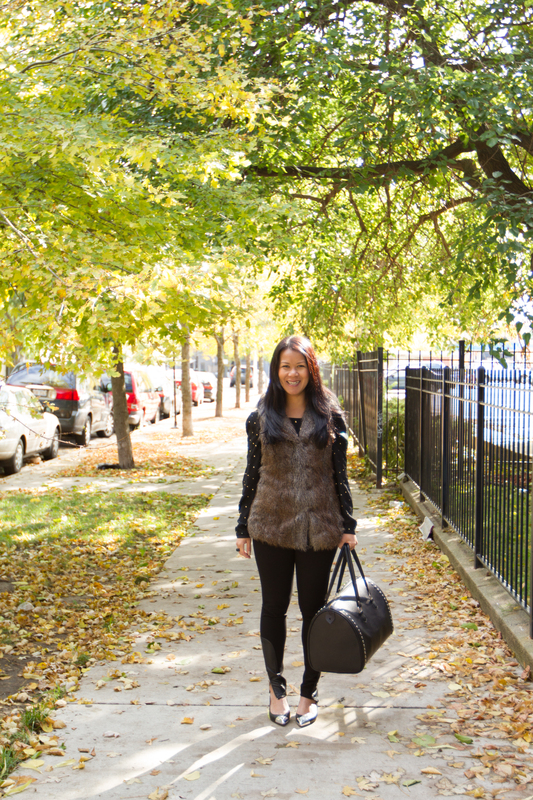 Last month we did a style shoot with one of our favorite Chicago Stylists and fashion show guru, Savvy Souk. We always have such blast with her, so we asked her to pair an outfit with our bowler bag. Typically, these bags make for the perfect overnight or weekend bag. You can fit A TON of stuff in there AND they have a zipper, so perfect for any travel plans! However, with winter approaching, we tend to carry more stuff with us so I think they make for a great everyday bag. You can pack a laptop, clutch, scarf, mittens, keys, book ( honestly anything really) and look fabulous toting it around your city with you! We love how Souk played off the studs on our black bowler and wore a kitten heel with a metallic toe and a blouse that has metallic studs! So cute! Since it’s winter, you can get away with a whole black ensemble, maybe add a textured piece like Souk did with her faux fur vest! She looks fabulously chic and the bowler just completes her outfit! Check it out! Our bowler bag was made by Rachid in Marrakech, Morocco. He runs 2 small workshops and a retail space on the outskirts of the Marrakech Medina. He employs over 12 leather artisans, including pattern makers, tailors, and leather dyers. He began learning the trade at the age of 16, after finishing high school, and apprenticed with three different master leather workers before opening his own workshop five years later. He has an eye for combining Western design with Moroccan craftsmanship and reads Elle and Marie Claire to come up with new designs. ps, we are getting an oxford red bowler in for the holidays:) stay tuned!